The almost anything goes approach to labeling eggs has made it hard to know what you’re getting. Ever try to buy eggs laid by happy chickens? It’s really hard. You may not even realize how hard it is because it’s easy to be seduced by words like “organic,” “cage-free,” and “free range.” These labels are regulated by the USDA but the regulations aren’t all that specific. In fact, except for “certified organic,” the government does not set definitions or requirements for egg carton labels. This means commercial producers have enormous latitude when it comes to raising chickens. Some give hens plenty of space to move around in and others confine them to spaces amounting to less than a sheet of paper. So what are Americans looking for in a humane label? Most of us think it should mean that the animals have adequate living space, are allowed outdoors, and are raised without cages, according to a Consumer Reports study. In fact, the vast majority of egg-laying chickens, about 85 percent, are kept in small cages for their entire lives. Enter Certified Humane, Animal Welfare Approved, and other third party certification programs that push for better conditions for laying hens, and other farm animals. Some are more rigorous than others. Here’s a brief guide to what the labels mean. It’s complicated! None of these designations are relevant to animal welfare. The term “natural” describes foods that have no artificial or synthetic ingredients or colors, according to the USDA. Keep in mind that all eggs are, in fact, natural. The term “no hormones added,” is meaningless. The federal government has never allowed the use of hormones with poultry (or pork or goats). These terms are mostly marketing labels that indicate nothing about the level of care hens are given . Cage-free hens represent only 16 percent of U.S. chickens but their share of the flock grew by a third from 2016 to 2017, thanks to growing consumer interest in cage-free chickens. Cage-free is certainly better than living in cages, which don’t allow hens to spread their wings or move around. But life is hard for cage-free hens, too. The USDA does not specify the minimum amount of space each cage-free hen is allotted, which usually means they don’t get much. Nor does it require farmers to give hens any outdoor time. Best bet: Cage-free eggs paired with a Certified Humane label. This means hens are given at least 1.5 square foot of space each. Chickens raised as free range birds do not live in cages and are required to have “continuous access to outdoor space during their production cycle,” according to the USDA. This does not mean they ever go outside. It just means they have access to it, which could be something as minimal as a “few small doors that lead to a screened-in porch with cement, dirt or a modicum of grass,” according to NPR. “Anyone can put free-range on their labels,” says Adele Douglass, the Executive Director of Humane Farm Animal Care. Best bet: “Free range” coupled with a Certified Humane label, which requires there be a minimum of two square feet of outdoor space per bird. Most people would be surprised to know that somewhere between one-third to one-half of all "organic" eggs come from hens living in total confinement. The Trump administration recently left open a loophole in organic regulations that allows producers to pack as many as 100,000 birds to a building and call them “organic” if they attach a screened porch. The birds aren’t caged but there is nothing to prevent them from being crammed in, up to the ceiling in some cases. Some agencies, such as California Certified Organic Farmers, one of the largest, refuse to certify such operations as "USDA Organic." Best bet: Buy “organic” eggs distributed by small label farms. The vast majority allow their hens outside. Ninety percent of cage-free eggs sold in the US have been certified by the American Humane Association. To meet label standards, animals must be raised in an environment that limits stress, includes fresh water, a healthy diet, sufficient space, proper facilities, shelter, and a resting area. Forced molting through starvation is not allowed but beak cutting is. The label has been called “somewhat meaningful and verified,” by Greener Choices, an offshoot of Consumer Reports that reports on labeling. “Minimum space requirements are sometimes greater than the industry norm, but do not always allow for freedom of movement.” For instance, the label allows birds to be kept in cages that offer places to perch and nest, but gives them less than a square foot of space each. If birds are cage-free, they’re given a little over one square foot of floor space but no “enrichment,” like scratch pads or places to roost. Outdoor access is not required. Best bet: Eggs labeled “pasture raised” and “free range” gives them outdoor access. But there’s no requirement that hens ever actually get to go outdoors. This program, run by Humane Farm Animal Care, offers three levels of certification. Regular, or cage-free: Birds are uncaged inside barns but aren’t given outdoor access. They must be able to nest, perch, and dust-bathe. Free range: Birds must have access to an outdoor area at least two square feet for at least six hours a day. The outdoor space doesn’t need to have any living vegetation. Pasture raised: If your idea of happy chickens is giving them lots of space, look no further. 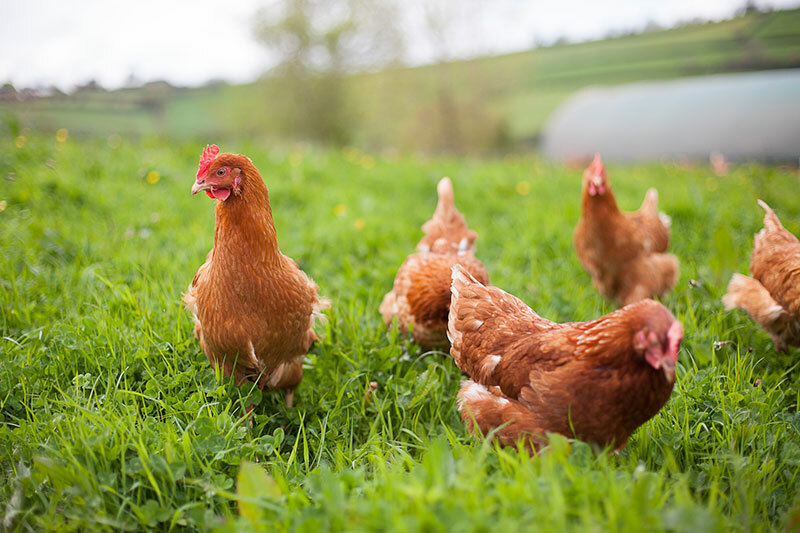 Birds must be placed on a pasture for at least six hours a day and each hen must have a minimum of 108 square feet. The pasture must be covered with living vegetation. Best bet: The premium is Certified Humane with “free range” and “pasture raised.” But its version of regular or cage-free is better than conventional farming. This label is the closest it gets to happy hens. It prohibits beak cutting and forced molting through starvation. It prohibits feed containing meat or animal byproducts. Each hen is given at least four square feet of space. And flocks must be small, fewer than 500 birds, and given continuous access to an outdoor area covered by grass and other vegetation. Cages are not allowed, except when it’s a safety issue. All hens must have access to housing that protects them from harsh weather and predators and gives them perching options. The henhouse also have to be clean and meet healthy air quality standards. In short, these hens live the good life. A solid bet. Bottomline: The only way that cage-free, free range, or pasture raised signifies conditions more humane than you’ll find on conventional egg farms is when the labels are paired with rigorous labels, like Animal Welfare Approved or Certified Humane. “Organic” eggs from small farms are also more likely to treat their hens well. Want to dodge the whole thing? Check out these simple substitutes for eggs, which include flaxseed, applesauce, vegetable oil, and more. We published Gwen the Rescue Hen to inspire compassion for factory farm chickens. It’s the happy, lighthearted tale of a hen who learns what it means to be a chicken after she escapes from a big egg-laying hen house. It’s also packed with fun facts about how awesome chickens are. (Did you know they can do math? Have good memories? Can be taught to ride a bike). The book is on sale everywhere, including Chelsea Green, Stone Pier Press, Amazon, and Barnes & Noble, and at local bookstores.